On 24th November 2009, I went to see the film Genova starring Colin firth at the Cameo cinema in Namur. Here follows a review of this film. Genova relates the story of Joe and his two daughters who leave the USA to go and live in Genova, Italy, some months after the accidental death of the mother. Kelly, the eldest, has fun in this new city, while Mary, the youngest sees her mother’s ghost wandering in the streets of the old town. 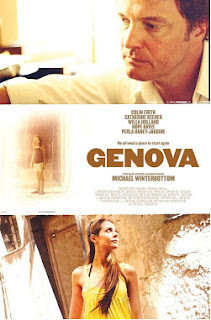 Generally speaking, Genova is a very slow film with almost no action. Some people would undoubtedly find it boring. However this wonderful film is heavy in emotions dealing principally with grief. We see how people start a new life after the loss of a loved one. This view is accentuated by the hot summer (in opposition to the snowy winter when the mother dies) The feelings are strong and it is impossible not to be moved. The father’s love for his daughters is also striking. You can see his benevolence but also his clumsiness: he doesn’t know how to deal with Mary and Kelly since their mother’s death. However his sensitivity reinforces the tenderness of the father-daughter relationship. Another interesting performance is that of Mary. The latter feels responsible for the dramatic car crash. She sees her dead mother through windows, on the streets and at nights she screams out because of nightmares. Her cries are extremely convincing: when seeing and hearing her crying you don’t have the impression that it is a film, you really believe that she is near you and you want to comfort her. It is heart-breaking. Besides Mary, her sister Kelly is also an intriguing character. She bears a grudge against her younger sister because as far as she is concerned Mary is responsible for the car crash. Moreover, Kelly is rude with Mary. She rejects her company all of the time and prefers her new friends and boyfriend. In addition to the characters, the way the film was filmed is worth being mentioned. When watching the film, you don’t have the impression you are watching a movie but rather that you are actually in Genova with the characters. You feel you are sharing their lives; you are a member of their family. A striking example is when the father swims in the sea, you really believe you are in the water with him because the camera is moving, it is not fixed. Your head is beneath and above the surface at the same time. You can really feel the family’s anxiety when Mary disappears. Furthermore the views of the town highlight different interesting aspects: we see the old town, the new town and the beach. The very narrow streets with high houses rendering it almost impossible to see the sky, give you a claustrophobic feeling of being a prisoner. By contrast, the landscape makes you feel free and offers hope for renewal. In conclusion, Genova is a film with artistic devices, in other words, miles away from big Hollywood productions. This film’s greatest assets lie in its strength and the complexity of the emotion involved.